A typical selection from my reporter’s notebook. Can you make out any of it? 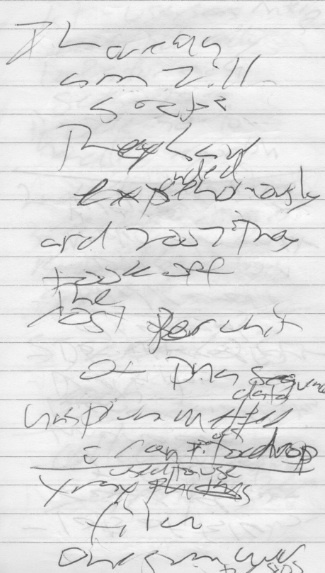 My typing, of course, is easily legible – even though my typing is pretty terrible. I’m able to erase the typos, blank spaces, merged words and other errors. Now it turns out that my crappy typing is just as recognizable as my crappy handwriting. In fact, we each have a characteristic typing pattern, and some Iowa State University computer researchers are capitalizing on that to strengthen information security. Morris Chang, electrical and computer engineering professor, and his team call them cognitive fingerprints, and they extend beyond typing to how we use a mouse or a mobile device. Their work with a $500,000 grant from the Defense Advanced Research Projects Administration (the famed DARPA) was good enough to get a second grant for $1.76 million. Basically, if you’re trying to use my computer but you’re not me, the software could spot that and take action – locking you out or asking for another password. Under the team’s current technology, the program captures users’ typing patterns during a 90-minute typing exercise. It’s a long time to type. My boss would probably say I could hardly type nine minutes, much less 90, without stopping to use the bathroom or get a drink. Given how algorithms steadily improve with tuning, I’d bet that Chang and his group eventually trim that. Users get added security in return for that time investment. Even if an intruder steals some passwords, the program could see the user isn’t who they say they are and take action. In tests, Chang and his team say they found a failure rate of just half a percent. They think they can improve that by scrutinizing mouse or mobile device patterns as well as typing. Meanwhile, University of Iowa researchers have performed a neat trick of a different kind: slipping DNA into cells to supercharge protein production and mend missing bone. When you hear of researchers introducing DNA into cells, it’s usually in the context of genetic engineering – using tailored genetic material to correct some disease-causing hereditary defect. One method is to modify a virus and “infect” the patient with it. The altered virus, like all viruses, inserts the engineered DNA into the body’s cells, hopefully fixing the genetic problem. Viral vectors have been troublesome, however, because they can trigger potentially dangerous immune responses. The U of I team instead uses synthetic plasmids – DNA molecules that replicate outside of the chromosome – to pass the desired genetic material into the cells. In a paper in the journal Biomaterials, the researchers describe creating a scaffold of collagen, a common component of connective tissue. They seeded the scaffold with the custom-made plasmids containing DNA that encodes a protein that enhances bone regeneration. They applied the patch to a small section of missing skull in test animals. Missing bone from a section of skull is nearly completely regenerated, at right, after application of a plasmid-doped collagen scaffold developed at the University of Iowa. Image courtesy of Satheesh Elangovan, U of I. The plasmids are compacted within a polymer and have a positive electric charge that allow nearby bone cells to take them in. In essence, the U of I approach turns the cells into bone protein factories. Usually, doctors must continually inject the protein to encourage bone regeneration, said Aliasger Salem, a U of I pharmacy professor and one of the paper’s authors. For me, the cool thing is that the treatment delivers gene therapy in a limited, targeted way, only to cells where it’s needed rather than throughout the entire body. After four weeks, the plasmid-doped collagen scaffold grew 44 times more bone and tissue in the area than an area with just the scaffold, and 14 times more than an affected area with no treatment, the U of I release says. As is usually the case, human trials are still years away, if they ever happen. But if they’re successful, the researchers say the plasmid-collagen combination could help rebuild jawbone to provide a foundation for dental implants. Of course, babies don’t have to worry about that stuff. Or about teeth. They would rather get a grip on their peas and potatoes, and a U of I study shows babies are mastering the language when they do. 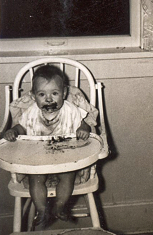 The researchers put 16-month-olds in high chairs and gave them nonsolid objects like applesauce and soup. The kids were given made-up names for the objects. A short time later, the researchers showed the kids the same items in difference sizes or shapes and asked them to identify them. This is not Pat. This is big sister Mary, many years ago. She’s a little more neat these days. The kids who interacted most with the food – you know, that messy way babies do – were most likely to correctly identify them by the fake names later, a U of I release says. Kids in high chairs also did better than kids who sat at a table, indicating that setting also is a factor. Larissa Samuelson, a U of I psychology professor, guessed that it’s because kids know the high chair is an OK place to get dirty. Kids can understand solid things and name them pretty well because they’re typically unchanging. But sloppy stuff? Like a lot of things, you have to dig into it to understand it, and that’s a toddler’s special skill. Of course, if playing with your food makes you a language master, my brother Pat ought to have been a Shakespeare.